Even though I love that the fact that it is no way, shape or form landlocked, Boston has never been my favorite place to live. I’ve never been able to put my finger on exactly why. We (the city and I) have simply been at odds. Despite that fact, I currently reside in Greater Boston; in the small city of Cambridge, aka Moscow on the Charles. The “Moscow” aspect is a Cold War reference designed to indicate Cambridge’s radicalism – as if the Cambridge Police Department is full of leftists. Since I have committed to be here, it kinda behooves me to have a historical understanding of the place where I am raising my son. I came across A City So Grand: The Rise of an American Metropolis, Boston 1850-1900 while rummaging through an actual, physical bookstore. I immediately added it to my pile and carried it to the checkout aisle. […] became polluted quickly since sewers continued to drain into the area and, because of the dam system, tides no longer washed it out twice daily. In the 1830’s two railroad lines were built across the Back Bay on low embankments and trestle bridges that extended over the mudflat. These lines further reduced water flow in the Receiving Basin, which further increased pollution. It was the prodigious proposal to fill and populate the Receiving Basin that is most commonly referred to as the Back Bay landfill project. Stephen Puleo does an effective job of describing some of the blood girding the transformation of the Back Bay. However, having almost reached the halfway mark, I have to say it is, effectively, an Eurocentric take the history. The struggle the Irish had in Boston is mentioned enough to be described as significant (if there wasn’t a population of work-hungry Irish, drunken roustabout Irish and children of Irish women with stalwart Catholic beliefs) there would’ve been no workers to fill in the Back Bay to make it the exclusive neighborhood it is today. 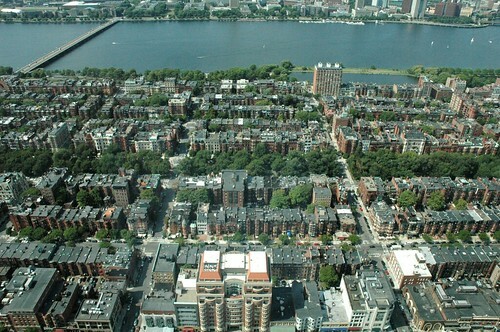 Now I understand that the Irish built the Back Bay of Boston in the same way I understand that the Chinese built the railroads. However, while the Irish were doing that, what were the black people of Boston doing? If it is truly a history of ‘the rise of an american metropolis’, then it has to include all members of that metropolis who contributed to its rise. Did Black people not contribute to the rise of Boston? According to this book, Black people didn’t, not even as footnotes. Of course, I am barely at the halfway mark but still, the absence is obvious enough to be mentioned. I can, and do, appreciate the irony (appropriateness?) of a currently exclusive neighborhood being built on pestilence. However, the lack of inclusiveness is such that it renders such appreciation pale and anemic. ~ by Tichaona Munhamo on August 12, 2012.